With Queensland’s spectacular Summer weather, it’s no wonder that Brisbane is jam-packed with festivals and holiday festivities to enjoy. Although with so many things to do in Brisbane and so little time, and with both our Meriton Suites hotels in Brisbane at the doorstep of the CBD’s best spots, it’s hard to know which are the best events to catch. So, here are our top picks for the best festivals and events in and around Brisbane. At Brisbane’s Powerhouse in November and December, some of the best international and Australian entertainers are given the spotlight with the massive lineup of events at the Wonderland Festival 2018. Promising a carnival of burlesque and cabaret, comedy, illusions and hypnosis shows, music, theatre, and circus and acrobatics, the weird and wonderful Wonderland Festival is one not to be missed. Is there a better way to kick off summer than with craft beers and ciders? We don’t think so. 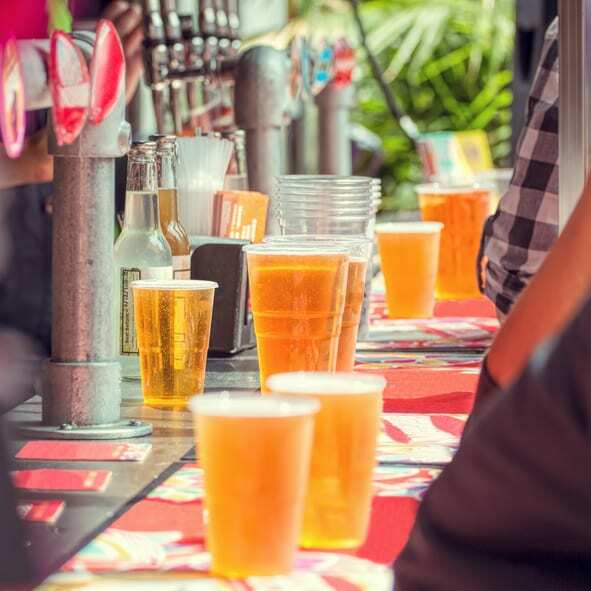 Head up to the Sunshine Coast for a taste of some of the rarest and most delicious local and New Zealand brewed beverages at the Craft Beer and Cider Festival. Pair your tasty beverage with some delicious local produce and street food, live music and roving entertainers, a sideshow for the young-uns, and rides. Just a block from Meriton Suites Herschel Street, Brisbane, Christmas lights explode with colour in the magical Enchanted Garden at the Roma Street Parkland. Weave your way through winding paths with lush flora and twinkling fairy lights, and make sure you keep your eyes peeled because there some little fairies hiding up in trees throughout the walk. Finish your enchanted walk out by the lake and grab some food at the food trucks and relax with some great live music. Although the FOMO by Day music festival is now sold out, there’s still a chance to catch the evening session. At most music festivals, you have to choose which stage or tent to stalk to see the artists you want, but this often causes a serious case of the FOMOs. So the FOMO festival changed that by scheduling all the artists on one stage, which means everyone gets to party and dance together. With six artists hitting the stage, this is bound to be a fun night. On Brisbane’s South Bank, the QAGOMA is Queensland’s home of modern and contemporary art. Opening on November 24, the 9th Annual Pacific Triennial of Contemporary Art (APT9) is an ambitious series showcasing some of the most challenging and thought-provoking paintings, sculptures, photographs, and installation art pieces from artists across the Asia and Pacific region. From January 18-20, APT9’s summer festival kicks off with APT9 artist talks, workshops, and an “up late experience”. Better yet, the exhibition is free! Ok, this one is a bit of a trek out of Brisbane, but this festival is definitely worth the trip just the sheer bonkers-factor! The Chinchilla Melon Festival is held in the “Melon Capital of Australia” and celebrates all things melon-y. Or we think it’s a celebration. There are a lot of melon casualties throughout the festivities including melon skiing, a melon chariot race, melon bungy, a melon tug-of-war, and loads more. Reserve your Brisbane Summer break with Meriton Suites for premium and easy access accommodation in the CBD.